If your business is running a blog, you know that it can be a very important and profitable part of your marketing plan. But if you’re new to blogging (and even if you’ve been doing it for a while), you might be intimidated by the creature of SEO: search engine optimization. Although SEO is intimidating, it is an important part of your business plan. Optimizing your blog posts for SEO will lead to more traffic and can equate to more business. We’ve laid out a user-friendly list of ways to optimize your blog posts for SEO. 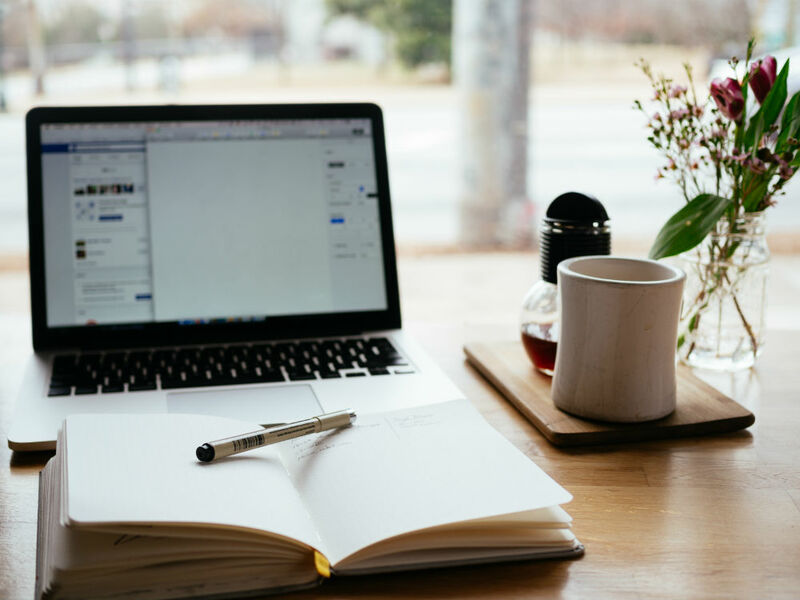 We’ve included tips such as using keyword phrases and images within your post, making sure each blog post has quality content, using your business’s social media to drive traffic to your blog, and using a WordPress SEO plugin to review your post and advise on areas of improvement. One important element of SEO for your blog is the use of keyword phrases. A keyword phrase is a short phrase that best encompasses the content topic of a blog post. When you write a post for your business’s blog, do some research to find the best keywords for the topic you are writing about. Your keyword phrase should be specific to the business or field you are in, as well as specific to the topic. It can also help to use a keyword that is popular, when possible. Once you’ve come up with a great keyword phrase, use it often within your post. It’s important to try to use the keyword in the title, headings, and subheadings of your post, as well as in the captions and titles of your images. The more you use your keyword phrase, the better chance you have of a search engine finding your post, and having it appear in someone’s search. While it is important to use your keyword phrase frequently, you do not want to overuse it. This is called “keyword stuffing” and the Google algorithm will penalize websites that do this. When creating your blog post, write quality copy and use the keyword phrase in a way that makes sense and flows for the reader. Writing a blog post is an art and a science, and you do not want to compromise the quality or flow of your post merely for the sake of including your keyword phrase frequently. Another important element of SEO for your blog post is the use of optimized images. If you’re including images in your blog posts, there are two aspects that need to be optimized for SEO: the image’s file size and the image’s title. When optimizing an image’s file size, there are a few parameters you will need to consider to adjust your images. These include the size in kilobytes (we keep ours under 100 KB), the type of image file (JPEG), and the quality of the image. These are all important because they allow your server to serve images quickly to the viewer, and avoid slowing down the website. If it takes over 2 seconds for a page to load, your readers most likely will leave the page. The Google algorithm will penalize a slow-loading webpage, which will hurt your site’s SEO ranking. Before uploading an image to your blog, you want to rename the image with a file name that is optimized for SEO, using the keyword phrase you have chosen for the post. When uploading an image to your WordPress blog and most other content management platforms, you will be given the option to add a title and alternate text for the image. You can use the title and alternate text for the image to fill the description box as well. The title, alternate text, and description can be the same, and should be a short sentence which contains your keyword phrase and somehow describes the image. It is not required that you fill in these fields, but they are helpful for SEO. When presenting your business to the online world, it is imperative that you produce quality content. Having well-written posts that address a topic with clarity will win you followers and keep them interested. Along with having quality writing in your posts, there are some practical elements you can implement to help make your posts perform well. 1. Length is an important element. In the early days of blogging and SEO, it was about producing more articles to show Google you had new content and length was not as important. As a matter of fact, short and easy-to-process posts were desired. Today, there is evidence that longer articles rank higher with Google. While length is important, remember to maintain quality over quantity in your blog posts. 2. It is also helpful to split your posts into sections with headings and subheadings. 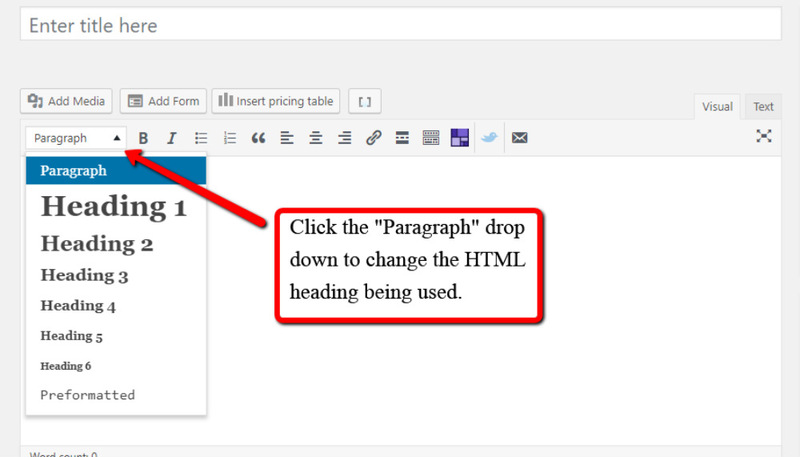 You can select HTML subheadings in WordPress and other content management platforms, from H1 – H6 to indicate hierarchy. Search engines scan these headings to determine the structure and content of a post. Make sure to include keywords in your headings and subheadings. Posts which contain headings used in the proper hierarchy are rewarded in a Google search. Make sure to honor the hierarchy when using HTML headings. Use H1 once but only once within an article – this is the biggest and primary heading. Use the other headings in order to achieve proper hierarchy; for instance, try not to jump from H2 to H4 and back to H2. After using H1, H2, and H3, use H4 – H6 minimally, as these lower HTML headings do not hold as much weight in SEO. Structuring your blog post by using headings and numbered or bullet-pointed lists can also help your blog posts be more reader-friendly. Optimizing your blog posts is crucial for getting traffic to your site. Google sees this, and gives more juice to sites receiving more traffic. Traffic to your site tells Google that this is a page people are frequently visiting. Your post will rank higher in a search because Google sees this traffic as a positive signal that your site is an expert on the topic addressed. You can increase traffic to your website by sharing your blog posts on social media. When you link to your blog on your social media channels, the link clicks from your social media followers drive traffic to your blog. Both organic social media posts and paid ads can aid in driving traffic by getting the link out to many people. For instance, using Facebook ads to promote your posts can greatly increase the number of people who see your content. . Your business can use plugins in addition to your content management platform to help you optimize your post and then gauge how well it is performing after it has been published. At SocialNicole Digital, we develop and use WordPress websites because they are the leading content management platform and are extremely SEO friendly. Our favorite plugin is called Yoast, Yoast displays the strength of the post based on the keyword you enter and parameters that affect SEO. Things like readability, keywords in meta-data descriptions and title (what shows up in Google Search) and headings are evaluated. Yoast will give your posts a colored dot, with a key to the color code at the bottom, telling you the strength of your post. And also advise you on what you can do to improve it. Your business should be paying attention to this as you work to build your SEO for your website. Overall, it is important to be patient and to understand that SEO can be a long process. Creating a wildly successful blog with thousands of readers is not going to happen overnight. However, it can happen over a period of time if your business is consistent about working to optimize each post and make sure each post is the best it can be. Keywords, images, headings, paragraphs, and length can all be curated to benefit SEO. Sharing your business’s blog posts on your business’s social media platforms can also help to optimize your posts by driving traffic to your site. Ultimately, the content itself is what is going to take your blog posts far, and you can keep track of each post’s performance and SEO ranking, as well as determine what needs to be changed, by using an SEO plugin such as Yoast for your blog. Keep up the good work! Don’t lose heart and remember you will get out of your blog what you put into it. In the meantime, we are happy to help your business get its blog soaring however we can! You can sign up for our free updates and feel free to contact us with questions so we can help you optimize your business’s blog!